Beyond the veil of reality, beyond the influence of manipulating politicians, greedy merchants, iron-handed clergy, and the broken masses that toil for their benefit, echoes of other realms call to those bold enough, and desperate enough, to escape the oppression of mundane life. Treasure and glory await those courageous enough to wrest it from the darkness. But the danger is great, for lurking in the forgotten shadows are forces far stranger and more perilous than even civilization. The price of freedom might be paid in souls. 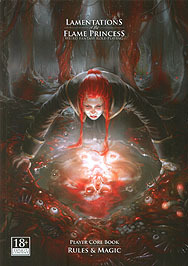 LotFP: Weird Fantasy Role-Playing presents a sinister and horrific twist on traditional fantasy gaming. Simple enough for a beginner yet meaty enough for the veteran, this game will make all your worst nightmares come true.